I dated a guy in high school named David. Whenever the phone would ring at their house, his sister would cry out, “SOMETHING TO DO!’ Back in the late 70’s it was the telephone that was our life line. Other than the mailman, that was how we found out what was happening around us. (radio and tv too), but we had to be “in the know” to get on the chain to find out who was having the party, where everyone was going to be. If you are anything like me you want to know what is happening. I don’t like to miss the things that I find interesting. ALSO I want to be a resource for friends to ask me, “What is happening this weekend?” Or when family visits, “Do you know what is going on at the Children’s Museum?” What if a change in the weather has turned your original plans upside down? There is a new version of an Event App that my company, Sephone just launched. As the original, it is specifically for events. 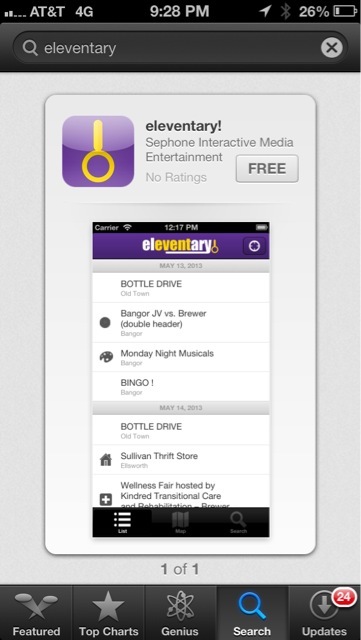 Eleventary, a FREE app for your mobile device to use, Based on your search criteria it will show you events nationwide. If you are going somewhere new you can use it to make sure you don’t miss something. If you are holding an event of your own, you can post it (also for FREE) to have people know about it. Posters are a pain. If you have a garage sale, you put posters on telephone poles (even tho no one can see them), then you should take them down after the sale. You may run an ad in the paper – this also costs money and takes time. To enter your event takes LESS than 2 minutes. AND once you are signed up, you can log in and add your daughters softball game or bean supper. INSTANTLY people can see your event that may not otherwise see it. You can raise more money, market your event or your customer’s events, all from one account. The Eleventary website is very easy to use. Access it right from your laptop! If your Rotary Club, church or garden club has something you want people to know about it is simple to plug it in for delivery to anyone’s smartphone that has the app. Why not go to Google and the Apple App Stores and start using it now! AND tell your friends! We all make ’em. AND if you are like me, you forget them too!! The last list I “forgot” actually dropped out of my pocket and it blew away, too fast for me to catch it. I may as well have left it home, except I didn’t have the pleasure of going back to the list on the counter and realize that I forgot the most important thing that was on it. We have a Social Media Marketing Class and sometimes we talk about Apps. What are your favorites? Like my last post, many are free and all are worth sharing. There seems to be an App for everyone! One student, we will call her “Jane” (very creative, right? ), said ” My favorite App is “OUT OF MILK” I never forget my Shopping List because I have it with me!” as she waved her phone in the air. I must say I go for the FREE versions first and then if I use it and love it, I am very willing to pay for it. Most often, these Apps that you pay for are a “Souped-Up” version of the free one. I don’t mind paying for something that I use and it is just what I want. In fact, I want to pay, if this is the case. Somebody spent a lot of time building this thing! I don’t want to pay for an App that doesn’t work right or isn’t what I thought it would be. The BEST thing is, most of us carry our phone or know where it is 99% of the time. (And that 1% of the time can be ugly!) If this ‘List App’ (Out Of Milk – Shopping List, Pantry App), is with you all the time; when you think of something to add you can- right then. When you are waiting at the T-Ball game, pull out your phone, add what you need to the list. Then when you got to the store, you can access it and buy what you need.You can even check it off the list! You also can add stuff you need “To Do” or better yet, your kids “To Do” List and all of these can be shared. Nope it isn’t too good to be true. It is a great App and “Jane,” thanks for the idea. I think I am in love…with the App that is. Now, if I can only get the man in my life to dump that flip phone and get a smart phone! Oh well nothing is perfect.